Here we will prove that if two given points on the base of an isosceles triangle are equidistant from the extremities of the base, show that they are also equidistant from the vertex. 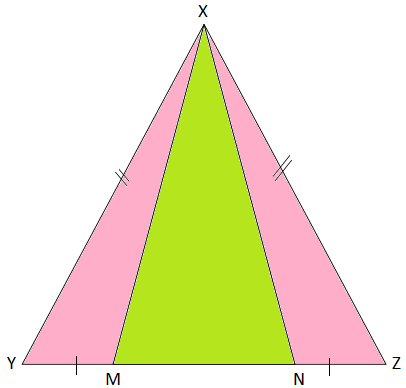 Given: In the isosceles ∆XYZ, XY = XZ, M and N points on the base YZ such that YM = NZ. To prove: XM = XN. 2. Therefore, ∆XYM ≅ ∆XNZ. 3. XM = XN. (Proved). (iii) Angles opposite to equal sides XY and XZ.